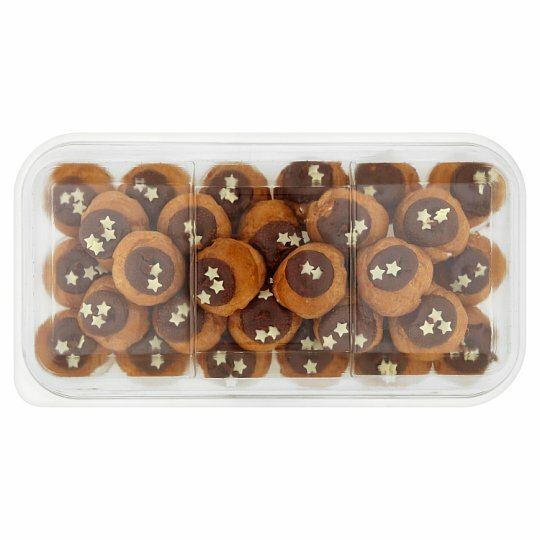 32 Choux pastry cases filled with stabilised cream (41%), covered in Belgian chocolate sauce (27%) and decorated with white chocolate stars. 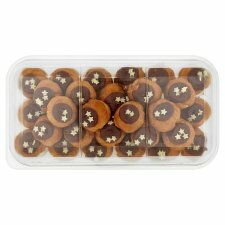 32 cream filled profiteroles individually topped with Belgian chocolate sauce and decorated with white chocolate stars. Stabilised Cream, Pasteurised Egg, Wheat Flour (Wheat Flour, Calcium Carbonate, Iron, Niacin, Thiamin), Rapeseed Oil, Belgian Milk Chocolate, Belgian Dark Chocolate, Partially Inverted Refiners Syrup, Palm Oil, Evaporated Milk, Sugar, White Chocolate Stars, Coconut Oil, Palm Kernel Oil, Fat Reduced Cocoa Powder, Whey Powder (Milk), Emulsifiers (Mono- and Di-Glycerides of Fatty Acids, Soya Lecithins), Dried Glucose Syrup, Milk Sugar, Dried Skimmed Milk, Concentrated Lemon Juice, Flavouring. Belgian Dark Chocolate contains: Cocoa Mass, Sugar, Emulsifier (Soya Lecithins), Flavouring. Keep refrigerated. Once opened, consume within 1 day and by 'use by' date shown., Suitable for home freezing. Ideally freeze as soon as possible after purchase but always by 'use by' date shown., This product may have been previously frozen and has been restored to chill temperature under carefully controlled conditions. Defrosted: It is still suitable for home freezing., Defrost thoroughly for a minimum of 4 hours in the refrigerator. Once defrosted, do not refreeze.